Updated Sunday February 10, 2019 by Christine Pulsifer. Thank you for your interest in helping our organization provide a quality, safe, and fun experience for the boys and girls of our community. We cannot provide this service without your generousity and support. Northboro/Southboro Youth Football and Cheer Association is a 501(c)(3) non-profit organization operated entirely by volunteers. 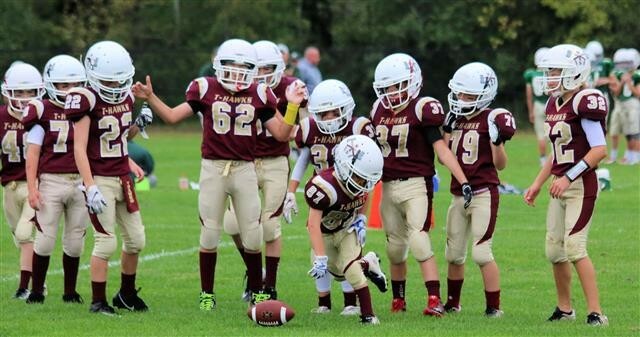 Proud to be a member of Central Mass Youth Football & Cheer Conference of American Youth Football, our mission is to provide an equal opportunity for all children to participate in a safe, fun, competitively-balanced and organized setting. All funds raised through sponsorship go directly towards the purchase and ongoing maintenance of all equipment (including annual safety testing of every helmet and set of shoulder pads), uniforms, practice and games field rental, insurance, referee & EMT fees, scholarships for families in need, and many other safety and operating costs. If you would like to become a sponsor, or know of a company that might be willing to sponsor our organization, please email NSBod@jrthawks.com to speak with a member of our executive board.